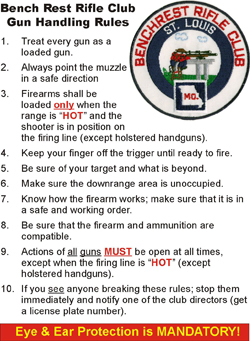 This Safety Plan has been established to ensure the health and safety of those individuals who use or frequent the Bench Rest Rifle Club of St. Louis, and ensure the safety of the community at large. Members must abide by the following rules, and members are expected to call to the attention of other members any infractions, which are observed. The ranges are operated in a passive manner, i.e., members are free to shoot at any time with self-supervision, except during peak shooting periods, at which time a range officer may be present. Failure of members to abide by the rules and police themselves will result in loss of random access and the establishment of specific days and hours of range operation. Therefore, each and every member is encouraged to do his/her part to ensure that we can continue to operate our range safely in a passive manner. In order to continue to stress the importance of our range rules and the necessity of maintaining safe ranges, all members are required to attend a basic Firearms Safety Orientation, hosted by one of the Club Directors, at which time the range rules and rationale behind them will be explained. We have certified Range Safety Officers. When they are on the range they will display a large orange flag with RSO and their individual identification number. They have the responsibility for range safety. Members are required to follow their instruction if given, if you feel their instruction was unnecessary get their name or I.D. number and contact one of the Board of Directors. 1. Club access is restricted to your membership “key card” only. You are responsible for guests from entry to exit and to ensure that they obey the range rules. 2. Guests of a member are only permitted to use a range when in close proximity of the member who invited them. Members are limited to two guests on the firing line shooting at the same time without the supervision of a non-shooting RSO. 3. The speed limit on the club roads leading to the ranges is 25 MPH. The speed limit at the range area is 5 MPH. 4. Firing is limited to daylight hours. When the Dusk to Dawn lights come on, on the firing lines or on the front of the buildings facing the firing line, all shooting will stop. Absolutely no shooting after these lights are illuminated without Board approval. Remember you should always be able to clearly see the backstop that your projectile will impact into. If in doubt, don’t shoot. 5. When scheduled matches are in progress, no one except those registered in the match are permitted to use that range. 6. Ranges will be closed prior to match time in order to facilitate preparation for the match. 7. No live ammunition or components (live rounds, duds, live primers or gunpowder) shall be placed in trashcans. Put them in the brass barrels. 8. Everyone is responsible for cleaning up after themselves. Leave it better than you find it. 9. Any unintentional discharges where a round may not have impacted into a backstop or where any incident has occurred requiring first aid must be reported. 12. Rule infractions can be cause for dismissal from the club. 1. It is every shooters responsibility to make sure all shooters on the firing line, is aware of his/her intent to go down range before the safety lights are turned on.YOU MUST ACCOUNT FOR ALL SHOOTERS ON THE FIRING LINE! Before the safety lights are turned off. 2. All shots must be controlled and there must be at least(2) SECONDS between shots where the backstop is beyond 15 yards, excludes clay bird doubles. 3. NO ALCOHOLIC BEVERAGES ARE ALLOWED ON THE FIRING LINE. Those who have consumed alcohol may not shoot, handle or be on the firing line where firearms are present for the remainder of the day. 4. Targets are to be hung or changed as directed by the Range Safety Officer or by common agreement. 5. Full cooperation with the Range Safety Officer or Officer in charge is required of everyone. 6. No children under 12 years of age are permitted on the firing line unless supervised 1-on-1 by an adult. Small children must be supervised at all times. 7. ALL SHOTS MUST BE AIMED AT TARGETS. SHOOTING AT OBJECTS ON THE GROUND IS PROHIBITED. 8. FIREARMS RESTRICTIONS; Fully automatic weapons or select fire weapons are prohibited. .50 BMG caliber rifles are only allowed on the 60 bench range and specific firing points. 9. AMMUNITION RESTRICTIONS. Firing of any steel core, armor piercing, incendiary, tracers, explosive tip or other pyrotechnic ammunition is prohibited at all of the ranges. 10. Do not move target frames; make sure that the number on the target frame corresponds with the bench number. Match Directors may adjust the range for competitor practice prior to the match. Do not crossfire..No one may use personal target stands without written Board Approval. 11. NO ONE SHOULD BE IN FRONT OF THE YELLOW LINE AT THE FRONT EDGE OF THE CONCRETE WHEN THE FIRING LINE IS HOT. 12. Ear and eye protection is Mandatory on all ranges. 13Shooting at ANY wildlife is strictly prohibited, no hunting is allowed on the Club property. KEEP YOUR FINGER OFF THE TRIGGER UNTIL READY TO FIRE. BE SURE OF YOUR TARGET AND WHAT IS BEYOND. KNOW HOW THE FIREARM OPERATES; MAKE SURE THAT IT IS IN A SAFE AND WORKING ORDER. BE SURE THE FIREARM AND AMMUNITION ARE COMPATIBLE. TREAT EVERY GUN AS A LOADED GUN ! 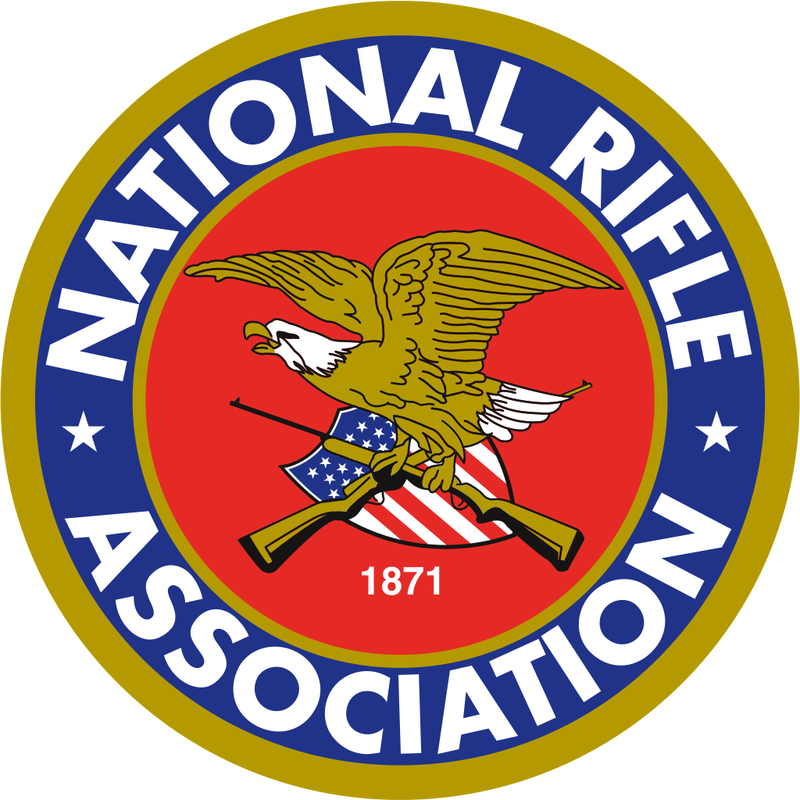 No one may shoot beyond 200 yards unless certified by the Board of Directors and when shooting beyond 200 yards they must display this certification. 1. Targets must be properly hung on the target frame corresponding to the bench number so that frames and posts are not damaged. No cross firing is allowed. 2. Absolutely no shooting of pistols or revolvers on the 60 bench rifle range. XP-100 and Thompson center or hunting type pistols are allowed when chambered for center fire rifle cartridges that have a muzzle velocity of 1800 FPS or more. 3. All projectiles must impact into a backstop. This is the shooters responsibility. 4. When target changes are time consuming because of 300 and 600 yards, a shooting time of 30 minutes between target changes should prevail. 5. In non-match situations, persons in the 600-yard pits while the range is hot must remain there until those on the firing line physically go down range to relieve them. No vehicles are to be parked down range while the range is hot. 6. If the gate to the 600 yard pits is found open, persons desiring to shoot must first physically go down range to insure no one is in the 600 yard pit area before they close the gate and open the range for shooting. 7. It is especially important to have knowledge of the trajectory of the cartridge being used if you are planning to shoot at 600-yards. 8. Do not shoot magnum cartridges, 50 BMG or its derivatives at the 200, 300, 385 meter metallic silhouettes, it WILL damage them, these are allowed on the ram at 500 meters. 9. When shooting from a bench the muzzle of the firearm shall be in front of the front edge of the bench. This reduces the muzzle blast. 10. 50 BMG rifles are only allowed on firing points 1, 2, 3, 4, or 57, 58, 59, and 60. 1. All handguns must be carried with cylinders open or slides back unless they are in shooting boxes/cases or carried in a holster. 2. Centerfire, rimfire, muzzleloaders and shotgun slugs may be fired on the pistol range. Do not shoot shotshells. 3. All shots must be aimed at targets. Pistol shooters are prohibited from "fanning” revolvers and from shooting from the hip. 4. No drawing (draw and fire) from a holster of any kind when behind the bench under cover. You may draw and fire on the short backstop (where there is no roof) with bench removed from between you and the targets. 5. Steel targets are for .22 rim fire pistols / rifles and center fire handguns up to and including .44mag., absolutely no center fire rifle calibers are to be shot at the steel targets including pistol calibers fired from rifles / carbines. 6. All projectiles must impact into a backstop. This is the shooters responsibility. 1. All Pistol range rules apply at this range. 2. Only open when there is a Match on the main pistol range. 1. CLAYBIRD AREA: NO SLUGS. Slugs may be shot on the pistol range or the 20-bench rifle range. 2. PATTERN BOARD AREA: NO SLUGS. Slugs may be shot on the pistol range or the 20-bench rifle range. 3. No Pistols or Handguns are to be discharged on the Shotgun range. 4. Absolutely no shot larger than # 6 is to be shot at aerial targets. 1. Targets must be properly hung on the target frame corresponding to the bench number so that frames and posts are not damaged. 2. Metallic silhouettes may be used on this range with 22 rimfire rifles only. The silhouettes must be placed on proper stands (high enough for a miss to impact the backstop). 3. Do not shoot shotguns loaded with shotshells on this range. They will destroy the target frames. 4. When shooting from a bench the muzzle of the firearm shall be in front of the front edge of the bench. This reduces the muzzle blast. 5. All projectiles must impact into a backstop. This is the shooters responsibility. 6. Absolutely no rifles of .50 BMG caliber are allowed on this Range. RESTRICTED USE OF THE 300 YARD TARGETS. Before use members must be certified by the Board of Directors and display their certification while shooting beyond 200 yards. 1.Shooting hours of operation—Monday through Saturday—7am till 6pm and Sunday 8am till 6pm, during day light savings the light on the building behind the firing line will determine cease fire. 2. All projectiles must impact into a backstop. 3. No shooting of handguns on the rifle range area (benches numbered 6 through 30). 4. Metallic silhouette stands are not to be used. These are for Match use only. 5. Do not move target stands: they must remain in their proper position for safety. 6. Do not shoot shotguns with shot shells on this range. They will destroy the frames. 7. When shooting from a bench the muzzle of the firearm shall be in front of the front edge of the bench. This reduces muzzle blast. 9. Absolutely no rifles of .50 BMG caliber are allowed on this Range. 2. All shots must impact into the intended backstop. 3. Two seconds between shots. 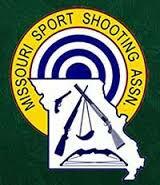 © , Bench Rest Rifle Club of St. Louis.